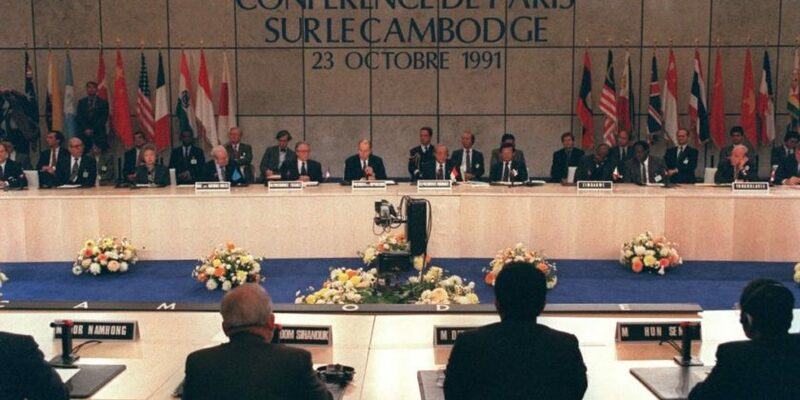 October 23, 2016 is the 25th anniversary of the signing of the Paris Peace Accords, the agreements between four armed factions in Cambodia supported by eighteen countries aimed at ending the violent civil war. The Peace Accords marked a significant moment for Cambodia, a moment in which different groups were united in their vision of peace for Cambodia. Following the agreements, efforts were put into motion to bring home Cambodians who had fled the war, and to begin rebuilding the country – not only the physical rebuilding but also the spirit of Cambodia. To celebrate the remarkable resilience of Cambodians during this period, CONSTABLE Gallery at Large and the Cambodia Peace Museum are collaborating on a photography exhibition highlighting the many ways this rebuilding took shape. RESILIENCE will feature work by three photographers who have documented different aspects of Cambodia’s journey: Tim Page, George Nickels and John Rodsted. A few photographs will also be featured at the Peace Museum Masquerade Gala on October 22, 2016 at Le Meridian Hotel in Siem Reap: A semi-formal evening featuring amazing auction and raffle prizes, an aerial silks acrobatic display, musical performances to support the further development of the Cambodia Peace Museum. The Cambodia Peace Museum, to be built in Siem Reap, will be a space for learning, sharing and reflecting on Cambodia’s journey from conflict to peace, emphasising the peacemaking efforts that supported this transition. Engaging exhibits will focus on topics such as the Cambodia Campaign to Ban Landmines, the Working Group on Weapons Reductions, and faith-based peace work such as the Dhammayietra.